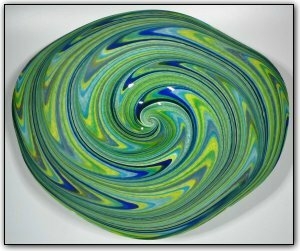 This multi-colored wallbowl is made from hand pulled cane and features many shades of blues, yellows, and greens, that all come together in the center in a beautiful psychedelic swirl. The pattern was made with canes of brightly colored glass, which is a two-stage time consuming process. First Dirwood hand pulled the canes used to make this bowl, then he made the wallbowl using those canes.